Posted on March 22, 2012, in Commentary and tagged Bioware, DLC, Ending, Forbes, Kotaku, Mass Effect 3, Muzyka. Bookmark the permalink. 6 Comments. The key words are clarity, further closure and artistic integrity of the orginal story. I’ve been predicting that there will be a free patch that does this. It won’t cost $$$ but it won’t be a new ending either. There will be DLC but that is a new mission etc, like taking back Omega maybe. The clarity etc will explain the relays and what happens to them. It will be explained that they don’t “blow up” like in Arrival but instead break apart. They may redo the cutscene to support this. And for why the Normandy was traveling a simple short cutscene that shows the 2 squadmates seeing Sheppard ‘die’ and them getting back on the shuttle. They tell Hacket and he orders Joker to go to system X to do thing Y since it appears they failed. With those explained you only have 2 things left. 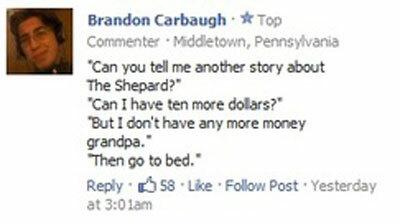 One is Sheppard taking a breath in the destroy ending and the other is the grandpa telling the story. Now if it was me I would have Sheppard die in all endings BUT the synergy one and the relays are only broken in the destroy ending. The control ending is also just a 50,000 year repreave as Sheppard leads them to deep space only for them to return in the next cycle. As for me I would have Sheppard die in all but the synergy one. I would love the see the nerdrage with this. There is full closure and clarity as to each option. And for those that complain about space magic and how can it happen I would add a simple thing like how the reapers modified the Protheans, made husks, did indoctrination etc. They used a secret propert of eezo to do it. Except that doesn’t make any sense. Even if they saw Shepard “die,” they should have tried to get into the beam themselves. It doesn’t explain Anderson’s teleportation trick, and it definitely doesn’t explain Hackett talking to Shepard aboard the Citadel. Even if we assume that that Hackett wasn’t really talking to Shepard, the fact that the Citadel arms opened up should have been an indication someone was inside. Maybe Joker picked everyone up and FTL jumpped through the relays without Hackett telling them Shepard was still alive… but that still doesn’t make a whole lot of sense. If Joker was able to pick up the crew, they could have picked up Shepard’s body OR they could have dropped someone else off in the beam. There is absolutely NO WAY to justify why EDI & Liara (the two crew I brought along) were on the Normandy. None. People were to get to the beam at all costs. That phrase was used three different times. A) The 10-second bonus clip indicates everything post-beam was a dream/indoctrination. B) Bioware writers half-assed the ending; bonus clip was an Easter Egg. I’ll have a post about this sometime. You are right as I forgot about the Shepard Hacket conversation. So the only way to fix it is to add a 5 second scene where Shepard orders his squadmates back to the shuttle while he makes the mad rush to the beam. That would leave why the Normandy is leaving. I really don’t think they’ll go with the dream/indoctrination idea as that implies a whole new ending. I firmly believe that Bioware will stick to the three endings but try to explain them better. And I also believe that they will push for the synergy ending and make it sound like the best choice since according to their notes that was supposed to be the ‘good’ ending. I just thought of a great way to explain this. While at TIM’s base they access the last console but it’s locked and password protected. it contains secret research about reaper weak points and hacking. Then on the Citadel after TIM dies he drops a data pad that contains his passwords etc. Shepard orders Joket to pick up all surviving members and head back to TIM’s base to unlock the data as it might help. That now explains why all squadmates and others (left behind at London staging base) are back on the Normandy and going through the relays. As for TIM remember that Cerberus had always done things with tech and AI that no other organization has ever done. It fits with the storyline and expains it pretty well. This Game Front article pretty much sums up your points here, and a few more to boot. It too has a great deal to say about your two squad mates, Joker, and the Normandy. Who would jump into a beam and expect his body to somehow lead to an ‘ending’ in the first place? What kind of beam would have such an effect if somebody jumps into it with his body? This whole idea of jumping into beams or opening a mechanic apparatus with your muscles is already so ridiculous that I have a hard time discussing how these endings can make sense. They don’t: it’s Hollywood. The ending is at best comparable to the Matrix ending. But who cares? Did you really expect Bioware to care about logical consistency?